I started research about my grandmother Ruth in 1998. During this time, I hunted for Miller High Life Girl in the Moon collectibles at estate sales, flea markets and other thrift sales. 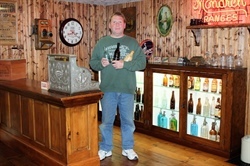 See photo of me next to my Miller Girl exhibit at the National Brewery Museum, Potosi, Wisconsin. (Located on second floor in NE corner of building) I am published in the American Breweriana Journal issues #182 Proof of Ruth March/April 2013 and #189 Proof of Tom May/June 2014.There are more articles coming soon. When first starting to collect stoneware, it was with Red Wing some 30 years past and it was the zinc glazed pieced I adored. I loved that creamy white glaze, great sheen and perfect stenciling. While all the seasoned collectors were screaming salt glaze, I thought they were in early stages of dementia. So I was taking advantages of those under privileged collectors and began trading and selling my salt glazed finds for those perfect zinc pieces they had in their collections. After 10 years of collecting those unspoiled zinc glazed pieces, I began to drift ever so slowly to those early primitive salt glazed pieces. It was not long after that my love of salt glazed began to change and I commenced to appreciate those primitive pieces of stoneware and the potters that fabricated them. In my early years of collecting, those seasoned salt glazed collectors came after me like maggots on decaying meat. They invited me to their homes to exhibit their zinc glazed pieces they had to trade or sell and while there I viewed their collections. A few of these Wisconsin Red Wing salt glaze collectors also collected Wisconsin Stoneware along with Red Wing. I remember saying to myself “Red Wing salt glaze is quite crude, but this Wisconsin stoneware should be buried and never seen again”. Well as I started to shift my Red Wing zinc glaze to salt glaze, it was not long before I began to appreciate those hand drawn decorations and how primitive some of these pieces were, yet still attractive to view. As my salt glaze collection began to grown so did my desire for these pieces to become even more primitive. I think it was at that time when the mule kicked and those buried never to be seen Wisconsin stoneware piece began to emerge. 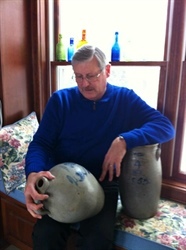 In or around 2002, I began to gather all the information I could find on Wisconsin Stoneware. The more I read, the more intrigued I became. It was the short production period, glazes, history and rarity that fired the furnace inside me. After finding a few nice pieces of decorated and signed Wisconsin Stoneware pieces I was extremely impressed on how well they displayed along side my Red Wing salt glaze pieces. It has now been10 years that I have been collecting Wisconsin stoneware along side of Red Wing and I have loved each and every find I have found, fought for, threaten to behead and held ransom to achieve. My interest is decorated & signed Wisconsin Stoneware (along with nicely decorated Red Wing salt glaze) which may hold a different decoration than I have in my collection. 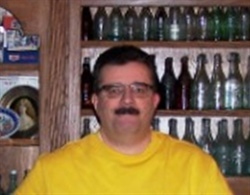 I have been collecting bottles since 1976 and have been a member of the Milwaukee Antique Bottle and Advertising since 1977. 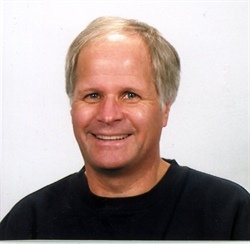 I am currently the President of the MABA and throughout the years I have served the club in the positions of President, Vice President, Director, and Show Chairman. I started collecting bottles while pursuing another hobby of mine, SCUBA diving. 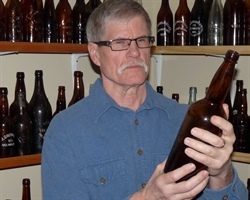 I found some bottles while diving in a lake in Wisconsin and went to the library to attempt to find any information that I could about them and one thing led to another and soon I was deeply immersed in both hobbies. Click on the photo to see Sid's full wanted list. 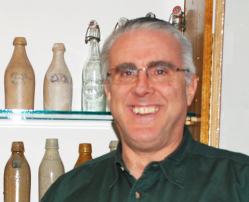 I have collected antique Wisconsin soda bottles for many years. 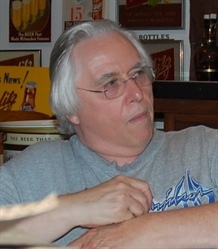 I am the author of the book on soda bottles titled Wisconsin Soda Water Bottles 1845 to 1918 and am currently working on several other books on Wisconsin soda bottles. I have an extensive list of items I am looking for - click on the image at left. If you have any of them please contact me. email Roger. Click on the photo to see Roger's full wanted list. I collect hutchs, Pre-Hutches, Quart hutchs from Wisconsin. Also West Bend, Slinger, and Hartford area items plus inks, poisions and various other bottles. I would love to find a paper labeled hutch from Wis. or perhaps even a pre hutch or West Bend brewing co bottle from West Bend! The one with a horse shoe on the front of it would be nice also. And, just like most collectors, I have a large collection of pretty window bottles. 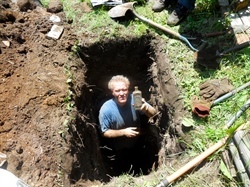 I am a digger of privies and a hunter of treasure. I enjoy digging privies (old out houses) and have had a lot of luck finding nice things over the years both in and around old privies. In addition to bottles I'm also into metal detecting, both land and water. You never know what will pop out of the ground when your detecting! 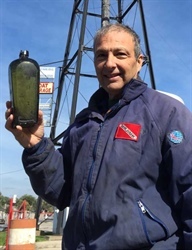 In fact that's how I started collecting bottles as one day a while back I had a signal and when I dug it up it turned out to be a hutch with the stopper still in it. Things sorta took off from there. I really enjoy collecting anything related to bottles from the cities of Racine and Kenosha. I was born and raised in Racine and currently living in Somers which is just a small town right in between the two. The bottles I lust after include soda, beer, pharmacy, milk, seltzer, whiskey flasks, medicines, dose cups- anything thing that is embossed, debossed, paper labeled, or paint labeled. These bottles are from the 1860's all the way up to 1970's. For some reason though I have little interest in anything to do with Johnson Wax products or Horlicks Malted Milk. Anyway, I also enjoy collecting items related to these bottles including bottle openers, wooden cases, pictures, advertising give-aways, calendars, old letterheads, just about anything. I also collect any variants of the typically green purgative water bottle embossed with Janos Hunyadi or the many copy cat bottles, any other Hungarian related bottle, Wisconsin etched seltzer bottles, Wisconsin hutchinson bottles, and Racine/Kenosha city directories or newspapers (pre-1920). I collect Waukesha souvenir china and Waukesha stereoviews. These items help tell the story of Waukesha, the Spring City. Waukesha was once noted for its many mineral springs, bottling plants and breweries. - Stoneware bottles from Wisconsin. - Bitters and whiskey bottles, especially amber strap-sided flasks. - Blob sodas, mint examples with wires, pontil marked and colored. Also John Matthews. - Beer bottles in mint condition with applied lips. - Unusual colors and molds from Wisconsin Glass and Chase Valley Glass. - Colored Hutchinson sodas from Wisconsin. - Decorated and signed stoneware from Wisconsin potters including Maxfield, O.F. Baker, Charles Hermann, Th. Gunther, Gunther & Berns, Bachelder, W.D. Mosier, Portage City, Cunningham, Farwell, Bonesteel, Chamberlain or Wisconsin territory pieces. 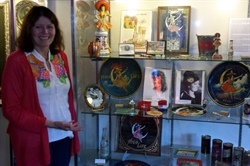 - Decorated pottery from Whitewater Wisconsin. If you have any of these items please Email Peter. 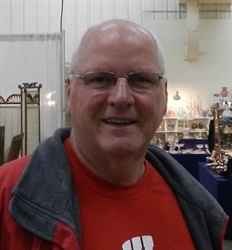 I collect items from Neosho, Wisconsin and surrounding areas. I am looking for items bottles, advertising, post cards, advertising or any antique items from Neosho. Neosho is a small town located about 40 miles northwest of Milwaukee in Dodge county. I also collect Weber Brewery bottles and advertising items. If you have any of these items please contact me.